Soft grip screwdriver handle extends from 5" to 9 1/2". 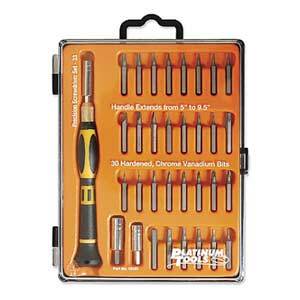 This high-quality 33-piece precision screwdriver set features super-tough, hardened, chrome vanadium tips. The molded handle provides a comfortable, non-slip grip and adjusts from 5 to 9 1/2, so it packs small but is still great for those hard-to-reach places. A smooth-action rotating cap speeds installation and removal of screws.